The Assayer gives the experimenter the ability to automatically add the last reagent just before reading the plate . All Torcon Luminometers incorporate a patented aperture plate providing the best optical design for sensitivity without crosstalk. The Assayer can add reagent and read the result in either 96 or 384 well versions at thirty plates an hour. 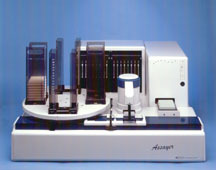 The Assayer holds 60 trays which it can process without operator intervention. A windows based program is easy to use for those not experienced in robotic systems.